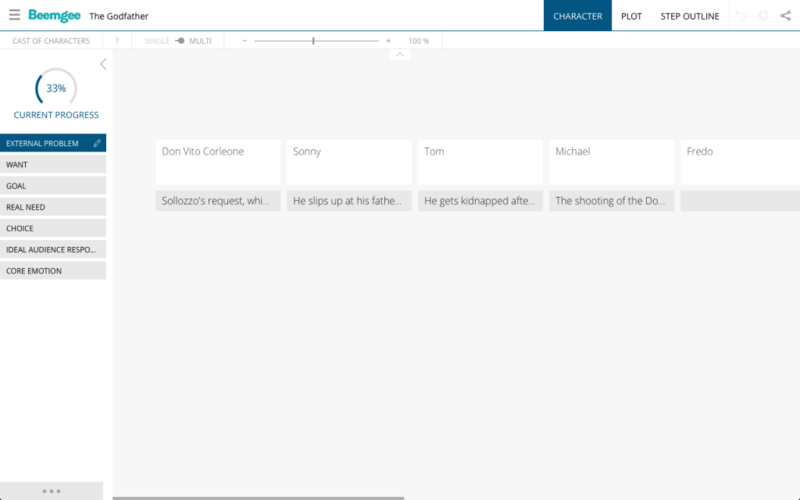 Click into a character card and write the name of a character. To create a new character click one of the plus signs above an active character card. If you’ve added characters in the PLOT area, you will see that each of them has a card here. Use the DEVELOP-COMPARE switch to get into the Beemgee character-builder itself. The character builder is about a lot more than characterisation. The plot of a story consists of the actions of the characters. The character-builder is a sequence of questions designed to help you discover the dramatic function of each of your main characters in the story, specifically by defining their actions and the motivations behind these actions. Answer individual character questions in single view. Answer each question carefully and succinctly, and this should help you determine the plot. Whenever you’re ready, go back to the COMPARE-view to see all of the characters. Compare and contrast your answers for each character by activating the attribute you want to see in the sidebar. Click the attribute in the sidebar to turn on the grid beneath the cards. To edit in the grid, click the pencil icon. You can drag and drop your character cards into any order you want. We suggest that you keep your main characters to the left. To delete a character card, drag it upwards. A bin will appear. Attention: Once in the bin, the card and all your inputs associated with it will be irretrievably deleted. 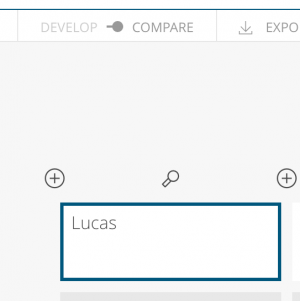 If the answers you typed in the DEVELOP view were too long to fit into the text fields in the COMPARE view, there is a PREMIUM function in the tool bar with which you can increase the grid size. You may edit your input texts in the compare view per attribute by clicking the pencil icon in the active attribute button. Then click into any of the texts for this attribute. The cursor will appear at the end of the text. Use the arrow key to move the cursor and edit. If you do not require all the attributes in the sidebar, consider hiding some of them. Clicking the three dots at the bottom of the sidebar will take you to a window where you can make all available attributes visible or invisible in the sidebar (this is the case whether you are in the character or plot area). In the character-builder, that means one attribute per question. Make your selection of which attributes you want to be able to activate through the sidebar, then click the x to exit this page. For more on how to develop your plot with Beemgee, click here. Anywhere in the Beemgee tool, consult the in-app help texts under the | ? | button in the tool bar to find out more about an active function. Have fun developing your characters! Beemgee saves your project automatically, so there is no “Save” button. If you have signed up to an account, FREE or PREMIUM, you can log out and close the project window at the end of each session. The next time you log in, go to the global menu top left next to the logo. In the menu you will find “All stories”. Select the project you want to work on. If you are not a registered user, you may press the share icon in the top menu bar, above right. Click the share button to send yourself the link to your outline. Beemgee has created a unique URL for your project. Keep this link safe – calling it up later will take you back to the state of your project as you left it. 3) bookmark this page in your browser or using a bookmarking service. Want to show your project to someone else? Send them the link. Anybody with the unique link to your project will be able to see and edit your work.